The weather was so fantastic yesterday that we just had to grill out for dinner. It would have been a sin not to. So I pulled out one of my many veggie/bean burgers from the freezer to grill. 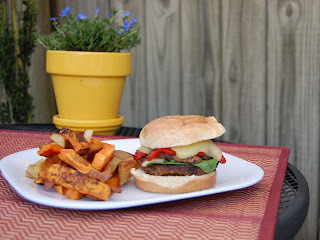 We also grilled sweet potato "fries" as well as portobellos and onions for topping the "burgers." Even though the pollen was starting to get bad again, we opted to enjoy the opportunity to dine outside. It was a pleasant change of scenery. Today ended up being an apple inspired sort of day. This morning I got up and was really craving my PB&J&B Oatmeal. Sadly, I was out of bananas. So I decided to try a Cinnamon Apple Peanut Butter Oatmeal instead. Yummmm. 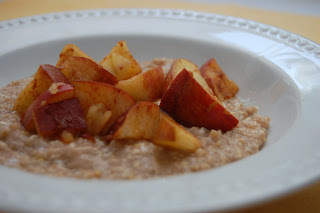 I cooked my steel cut oats per package directions adding in a heap of cinnamon and dash of stevia. I diced up apples and doused them with cinnamon and a drizzle of agave nectar and nuked until warm. I topped the oatmeal with natural creamy peanut butter and the apples. It was a really great flavor combo. After breakfast, Jason did weights and I did the Weights & Plates ab workout from Cathe's Abs Circuit before we headed down to the river trails for a run and picnic. It was another gorgeous day here, perfect for a post-run picnic by the river. Who can resist that? I made a Peanut Asian Inspired Slaw (just started mixing things together) to go in wraps with Edamame Hummus and Chik'n Meal Starters. It definitely hit the spot after a fast-paced 4-miler. We opted for a fast, short run over a slightly slower, long run today. I was full of running pep today for some reason and managed to run the 4-miles at close to my race pace from my last race. 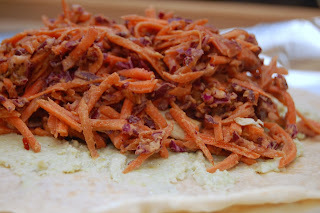 Use a food processor to shred the carrots and cabbage. In bowl, combine remaining ingredients then stir in carrots and cabbage. After we got home it was simply too nice to sit inside. So we pulled the covers off of the lounge chairs and sat outside for the rest of the afternoon. Chores will still be waiting tomorrow (they always are somehow). Dinner tonight was grilled tofu marinated in balsamic vinaigrette, grilled zucchini, yellow squash, and portobellos, with an Apple Cranberry Wheat Berry Salad. I made the salad yesterday so the flavors could meld overnight. 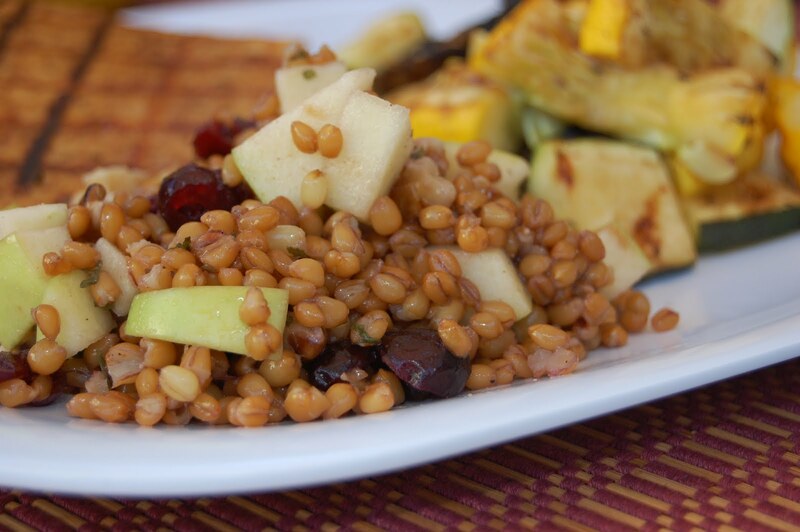 In large pot, cook the wheat berries in water for 60-90 minutes. 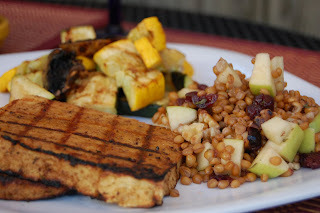 After the wheat berries have cooled, combine all ingredients. Season as needed and allow to refrigerate 1 hour up to over night. I must say that the wheat berry salad was so much better than I expected. There were so many wonderful textures and flavors. It paired so well with the tofu. The way Jason likens it is this: tofu would represent a light fish so it wouldn't compete with the complex flavors of the salad. this is definitely one that will stay in our menu rotation. Sounds like you had a great weekend. I love the peanut slaw idea! Something similar has been rolling around my head for a few weeks. Now you have inspired me to make it. I just bought some wheat berries and I am so excited to try! That slaw seriously rocks! I want to come to one of your barbecues, they always look amazing! your creativity in the kitchen is awesome! nice job! Alicia @ Vegan Epicurean it was a great weekend indeed. I can't wait to see what slaw you come up with!! Sarah @ The Ordinary Vegetarian you're welcome over anytime! Thanks Lisa @ I'm an Okie I get a ton of inspiration from my fellow bloggers! what a fabulous sunday!! LOVE the run+picnic...can't think of two better things to include in your day! I hope you're having a great monday and off to a great start to your week! Hey Lizzy @ Healthy Bites Conquer Athlete Appetite ! I agree on the run and picnic. It's a really nice way to relax after a run. Hope you're having a great one too!